TaxMasters Files for Bankruptcy | The Law Office of Emil Fleysher, P.A. TaxMasters Files for Bankruptcy | The Law Office of Emil Fleysher, P.A. TaxMasters, the tax-resolution firm, sought bankruptcy protection after coming under fire from multiple states’ attorneys general. The company listed debt of more than $1 million and assets of less than $50,000 in Chapter 11 documents filed in U.S. Bankruptcy Court in Houston. TaxMasters said it has between 1,000 and 5,000 creditors. The company estimates that funds will be available for distribution to unsecured creditors. Three affiliates also filed for bankruptcy, two of which will liquidate under chapter 7 of the U.S. Bankruptcy Code. 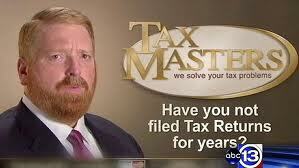 TaxMasters was sued in 2010 for deceptive trade practices by Texas and Minnesota attorneys general. TaxMasters used a nationwide marketing campaign to offer services for distressed taxpayers who needed help dealing with the IRS. A state investigation and nearly 1,000 customer complaints indicate that the defendants routinely misled customers. The commercials duped unsuspecting citizens into believing that their calls to the tax-relief firm would be answered by one of its “former IRS agents” or tax specialists. Instead of speaking with a highly qualified tax consultant, customers’ calls are answered by a salesperson providing deceiving information. Tax-burdened citizens are misled about the service contract terms, and are talked into paying thousands of dollars up front for a tax solution. The Minnesota attorney general is seeking restitution for the customers, and civil penalties against TaxMasters. The Texas attorney general is seeking restitution and civil penalties of as much as $20,000 for each violation of the Texas Deceptive Trade Practices Act. Two customers sued the company in September 2010 in Houston seeking authority to represent U.S. customers on a nationwide basis. The customers seek damages over TaxMasters explicit and implicit misrepresentations and violation of consumer-protection laws and breach of contract.